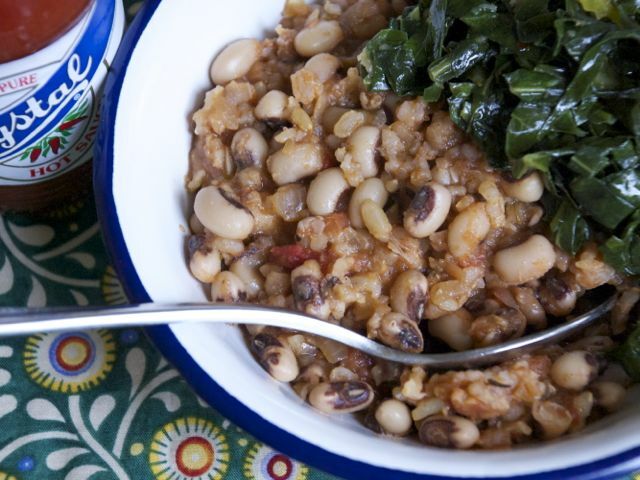 Although Hoppin’ John is mainly associated with the Carolinas, the dish is eaten throughout the South, especially on New Year's Day when it is thought to bring the eater good luck. After I returned to New Orleans from a semester abroad in France, Hoppin’ John was one of the first meals that I had. Here, I reinterpret the dish, adding tomatoes and a New Orleans-inspired spice blend, giving a nod to the “Afro-Euro-Creole flavors that curry favor” in Louisiana Creole cuisine, as Mike Molina would say. With all the post-Katrina politricks taking place in New Orleans, the city needs all the good luck it can get. Combine the black-eyed peas with enough water to cover them by 2 inches in a medium saucepan over high heat and bring to a boil. Skim off any foam, reduce heat to medium-low, and simmer, partially covered, just until tender, 50 minutes to 1 hour. Remove from the heat and drain. Drain the rice and add to a medium saucepan. Raise the heat to medium and cook for about 2 minutes, stirring often with a wooden spoon, until the water has evaporated and the rice starts smelling nutty. Add 1 tablespoon olive oil and continue cooking until the rice starts browning, about 2 minutes. Add the shallots, onion powder, garlic powder, paprika, chile powder, red chile flakes, cayenne pepper, thyme, oregano, and 2 teaspoons olive oil. Continue cooking, stirring frequently, until the shallots are soft, about 3 minutes. Transfer this mixture to a bowl and set aside. Over medium heat in the saucepan that the rice was cooked in, combine the vegetable stock, the tomatoes, and 1 teaspoon salt; bring to a boil. Add the rice mixture and the black-eyed peas to the broth, and stir well. Bring back to a boil, then cover, reduce the heat to low, and cook for 50 minutes, until most of the water has evaporated. Remove from the heat and steam with the cover on for at least 10 minutes. Serve hot with your favorite hot sauce.